Though Michael Haneke is at pains to stress the nuance of his opinions regarding digital life and discourse – see, for example, his recent interview with the BFI – it is undeniable that his film work has had a consistent approach to media and what he believes its effects are upon Western society. In many ways, his comments often denying such pessimistic interpretations simply don’t sit with the actuality of his films and perhaps explains why he often refuses to aid interpretation and reading of his work during interviews. His latest film, Happy End, is the epitome of Haneke’s questioning of visual media engagement, arguably first begun with Benny’s Video (1992). Following an Adornian ideology, Haneke ties over-engagement with media as an augmenter of behaviour, beliefs and morality. Happy End is a brilliant example of this where the collapse of Western piety is marked either aesthetically by new media or thematically (and within the diegesis of the film) as being symptomatic and complicit in the fallout and the cloaking of our ills. More so than simply media, however, it is what such distractions are hiding that ultimately forces the world of Happy End to disintegrate. Happy End follows a troubled Laurent family living in modern Calais who work in the construction business. Anne (Isabelle Huppert) is attempting to sort out the ramifications of a major collapse on one of their sites in spite of her son, Pierre (Franz Rogowski), making matters worse due to his alcoholism and potentially having caused the accident. Unusually both ends of the age spectrum in the family are contemplating suicide. The old father Georges (Jean-Louis Trintignant) is determined to kill himself and gains injuries from his attempts to drive his car into a tree. Eve Laurent (Fantine Harduin), Georges’ grandchild and the daughter of Thomas (Mathieu Kassovitz), is forced back to her father’s apartment with his new partner and child after she poisons her mother. She also attempts suicide. Thomas is having yet another affair; something that Eve knows and begins to obsess over. All of these differing strands play over the backdrop of the area’s migrant crisis, the final culmination of the film facing the current situation head on. 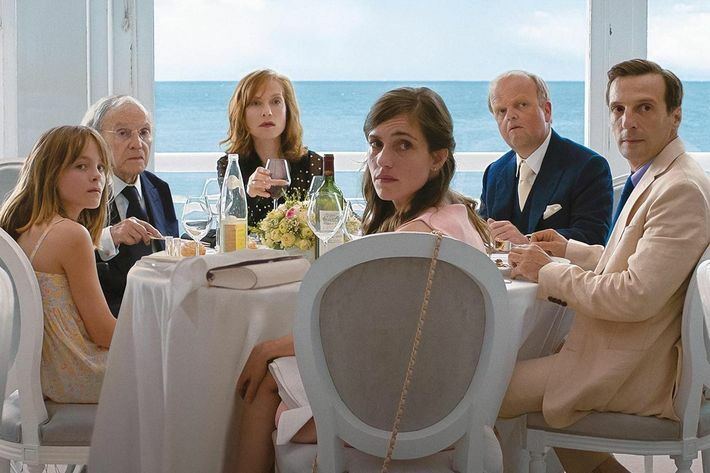 Happy End has three themes, often central to Haneke’s work and the film explores them individually over its various characters strands: collapse, fallout and gesture. 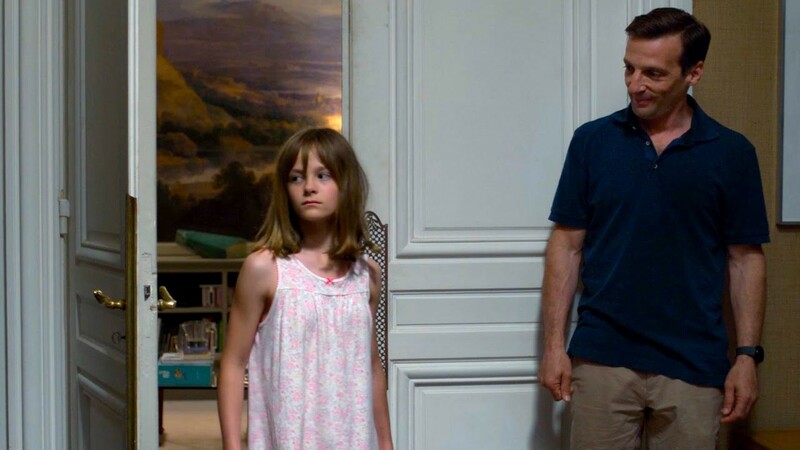 One of the most brilliant images in Happy End summarises perfectly Haneke’s filmmaking. His narrative worlds are so often about the unfurling of order, even in the most strict and seemingly organised of settings. From the world falling apart in Time Of The Wolf (2003) to the body and relationship succumbing to age and dementia in Amour (2012), collapse is key. Haneke often builds a contrast to this sense of collapse, creating irony by highlighting how organised the lives and places where it occurs often are. In Happy End this finds a very literal image in the disaster that starts Anne’s and Pierre’s narrative; the falling of a wall on a construction site, perhaps as the result of Pierre’s negligence, causing injury to one of the workers. There’s something within this image caught on a security camera (which again implicates the viewer, watching the collapse in digital, voyeuristic complicity), that frames the rest of the film. There are many supports within the wall that crumbles, the image of the concrete giving way seeming almost surreal at first (especially as the shot has an unusual length which first raises questions surrounding why the viewer is watching this everyday moment before the accident happens). The order of the scene gives way to this collapse just as it will for the characters and the area’s morality. In Thomas’ naivety, he has assumed that his relationship with his daughter is still stable in spite of clearly being distanced from her but, as it becomes clear to him later on, it has already collapsed just like his first marriage. The future of Anne and Georges’ company will also collapse when Pierre eventually collapses. Even Georges himself will ultimately collapse if he goes on living as he is suffering from dementia. Happy End is a film very much about the slow process of destruction. This image of the wall collapsing is merely a signal or cipher for the wider collapses all around. From all of these collapses comes the fallout; the emotional debris that finds a metaphor in the fallen concrete of the construction site. Happy End presents many examples of this including fallout from earlier collapses only told of throughout the film but not shown. Eve’s poisoning of her mother is the fallout from a collapse earlier in her life; her father leaving her mother for another woman. This has a secondary fallout in the film with her attempted suicide and, at the end of the film, her aiding Georges in his desire to die whilst recording the moment on her IPhone, just as she did for her hamster and her mother. The viewer is also given the hint of further fallout to come concerning Thomas: his new affair with a cellist, now found out by Eve thanks to accessing his social media and their backlog of dirty messages. The digital world has documented and ironically solidified the subsequent fallout, perhaps creating a sense of repetition to come for Thomas’ new young child. The most stark of fallout comes in scenes later on with Pierre which also touches upon certain elements of gesture when concerning Anne. A scene presents the man performing karaoke in a club. The camera is fixed as the garish lights and awful music plays (Chandelier by Sia to be exact). At first Pierre performs the song with energy before the release causes what can only be described as breakdown on stage. He violently cartwheels around, attempting to break dance before finally falling, causing the audience at the bar to ask about his wellbeing. The aesthetic rendering of this is overtly populist and modern; digital music, colourful lighting, hollowed ideas. This could be the fallout from a number of perspectives; the fallout of his heavy drinking, the fallout of his distanced relationship to Anne (who has very clearly put work before family for some time), the fallout from his own absent father, and the fallout of the guilt at causing the accident at the workplace. Pierre’s fallout also culminates in the film’s final moment of disruption, causing chaos at his mother’s wedding. In the face of all of this collapse and fallout, the characters in power do their best to hold face. In doing so, however, the most awkward element of the film comes to the fore; that of gesture. The gesture is often fake, a quick glean of morality trying to hide the mess of the total collapse. At Anne’s wedding, Pierre decides to interrupt their lavish meal by inviting a handful of Calais immigrants to the wedding, introducing each man loudly to the guests and ultimately attempting to force his family to recognise the collapse going on around them; one which they have clearly ignored. Anne’s new husband Lawrence (Toby Jones) tries to stop Pierre but he continues until he is escorted from the wedding. The moment of cringing gesture comes from Anne when she decides to have a table set for the immigrants and lets them stay for food. It is not the action that is the gesture but how she frames it. She proclaims loudly so everyone can hear that the group can stay as their guests, as if trying to signal their own moral superiority whilst ultimately still ignoring the issue that created it. It is fitting that her new husband is English; a subtle dig at the guilt of both nations and their exasperating of the issue. Of course, this issue haunts the film. The Laurents have immigrant servants, treated in an incredibly blasé way throughout the film in spite of often helping the family through their troubles. They are not at the wedding and only the political gesture by Anne’s son has allowed people of similar standing access to the middle-class happening. Even more appropriately is Georges’ final desire to wander into the sea; almost a privilege in comparison to the many who drowned trying to get onto land. The gesture is the attempt to mask the fallout, perhaps even to help deny that any collapse has taken place but, with its failure to convince being so acute, it cannot help but hint further towards an almost cyclic and constant collapse for both the family in question and ultimately what they represent; the Western middle-class unit, in desperate denial as to the stability of their morality and their own future.